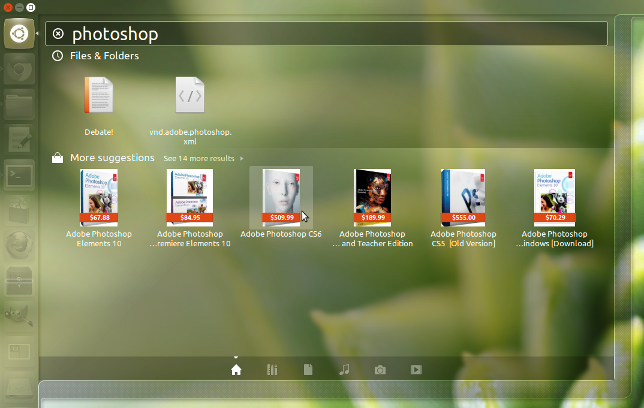 Here, searching the dash for Photoshop results in some pieces of software, all of which cost lots of money. These are all for Windows, but by presenting these applications in the dash, under the header "Other suggestions," we seem to be recommending them. It's quite likely that a user will assume, here, that the software works in Ubuntu. Finally, I searched for Bastion. Bastion is available for Ubuntu, which is really exciting. However, when I search in the Home lens, the only suggestion is (again) Bastion for Windows, from Amazon. John, we discussed about it yesterday. Assigning it to you and add to the release team track. Thanks! Hey, can anyone else confirm that this bug seems to be fixed (probably with the current version of the Amazon search proxy)?